I know there is a conflict between Israel and Palestine over the land which is now recognized as Israel. Palestinians and their supporters claim the land has been the residence of Palestinians and has been occupied by Israelis who moved to the region. There are many propaganda around the problem so I don't know yet the answer of some simple questions about it. Who were there before establishment of Israel? (Arabs or Jews?) Where from and why Jews moved there? Then what happened to the inhabitants of the land? If Jews moved to the land, was it their initial plan to move there and make a Jew state? What is the justification of Israelis to establish a country in the land? If you want to take a look historically, "Palestinians" as a sovereign nation did not exist until 20th century. Before 20th century, the land was Ottoman Empire's and then British control. More precisely, the historical chain of sovereignty goes: Ancient Egyptians, Canaanites, Israelites, Assyrians, Babylonians, Persians, Ancient Greeks, Romans, Byzantines, the Sunni Arab Caliphates, the Shia Fatimid Caliphate, Crusaders, Ayyubids, Mameluks, Ottomans, the British, and then Israelis again - source is Wikipedia). Note that NONE of the sovereign entities in the area were "Palestinian Arabs" - it was either foreign invaders, or Israelites. Score: Israelis 1, Palestinians 0, a bunch of other random actors 0.5 since they were foreign powers holding colonial control. Jewish presence in the area is several thousand years old, based on archaeological and historiographical evidence. Moreover, while the population was thinned by the exodus, there was an unbroken Jewish presence in all of what is both modern Israel and what is modern Palestinian Authority territory (As far as the latter, for example, Gush Etzion and Hevron, had Jewish communities that had existed for thousands of years before they were depopulated in Arab riots and by Arab armies in 20th century). On the other hand, Arabs have a pretty long presence in the area as well. While they lose on longevity (they mainly settled the aree after 0AD and especially 700AD), they win on numbers - during those years, there were indeed a lot more Arabs living in the area than Jews, being that Jews were heavily from living there by controlling foreign powers starting with Rome. An important note, however, is that those Arabs living there did NOT self-identify as "Palestinians", until 20th century. Score: Israelis 1, Palestinians 1. De facto, the land is partitioned between Israeli Jews and Palestinian Arabs soveregnity wise, if you ignore fine legalese details (no, there's no UN recognized Palestinian state; but we all know that it will be recognized at a drop of a hat). So basically, neither side has a claim to the WHOLE territory under this category, and each side has a claim to a subset of it. Score: Israelis 0.5, Palestinians 0.5. 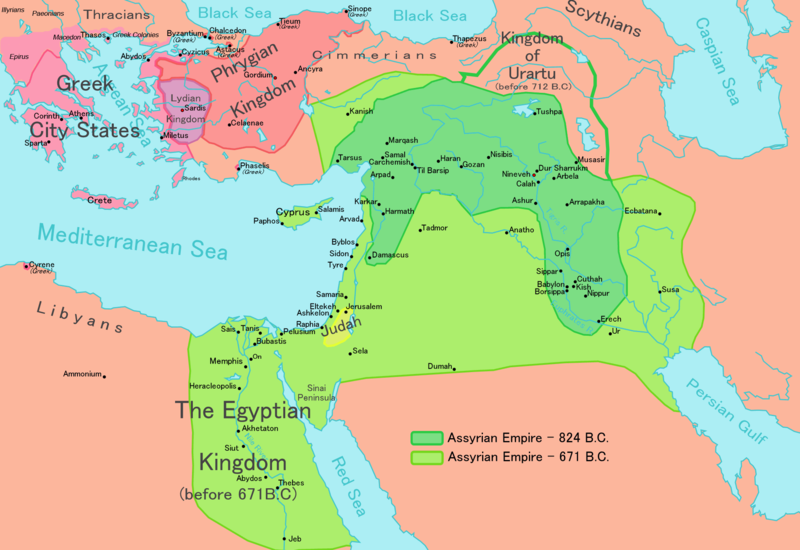 There are still Assyrian people with population between 3.5-4 million who might want back the whole neighbourhood of Israel, since there was a long period of time when they held it. Ancient Egypt also held Palestine/Israel territory for long time. Keeping a certain piece of land for a time doesn't create any right for it. It is a false judgement. Otherwise the complete surface of Earth would be way small for all nation's ideal image of themselves. Many pieces of lands are claimed by lot of nations. The way to hold a land: conquer it / negotiate for it / steal it / colonize it and then most importantly make other nations accept and respect your claim. Historically pretty much for whole Israel's territory both israeli and palestinian people have claim, and the ownership is disputed in all levels nowadays. How we own a land as individuals or a nation? Can we relate ownership of a land to a nation or tribe? For example can we say a part of earth is for Jews or Persians or Muslims? If a population once inhabits somewhere, does it make the land for them forever? Why some should live in hot deserts and some other enjoy lakes, rivers and jungles? Throughout history the human formed tribes or nations and fought for a land or other resources and expanded their territories. It is what happened and was the cause of many wars. It seems there is a contest and to survive you must struggle and fight. In this view, Palestine or Israel neither are right. Both sides have this right to fight to survive! But could be any other civilized manner to this problem? I think any human who is born have the right to have a home, the earth is for the people who live on it. If we segregate people to Jews, Muslems, Arabs, Blacks, Whites.... the situation get worse. we should regard them as individuals. The principle is if a person already have owned a home another person can't force him out. note I talk about an individual and not a tribe, this way any human can have home, they can migrate, find new places to live. Inhabitants of a region when find common share can participate in free elections and build a government to defy their rights. Democracy, human rights .... are civilized approach to the problem. In this view inhabitants of Palestine regardless of Jew or Arab or Muslem could form a secular and democratic nation. The land is for those who had home on it. its a mistake that we think we should replace the entire inhabitants of a land by a new tribe named Jews or Arabs or etc. some Jews may have migrated or settled there but it doesn't mean all other Jews have this right and should be invited to conquer the land, its an invasion. The land is for those who already lived there not for a new Nation or Tribe! I believe there’s a significant fundamental reality that must be considered when examining the nature of Arab Israeli conflict, and the merits (or the vices) of the sides involved, and that is: the Arab-Israeli dispute over land is NOT in essence about a conflict between two rival states; but a conflict between two ethnics groups. This is very important because the idea that this is a political conflict rather than geoethnic lends itself perfectly to the Zionist and even ‘pacifist’ argument (as in DVK's reply) for the two-state solution, based on the premise that both groups have "equal right" over the land because there has been neither an Arab nor an Israeli legal state on that land ever before the UN partition. But if we recognize the important fact that this has been first and foremost an ethnic conflict on one side of which we have Palestinian Arabs who've been living on the land of Palestine for a good number of centuries (that's why they came to be called 'Palestinian' after all) before the Zionist movement and the UN partition; and on the other, a group of alien foreigners (Jews) forcing themselves upon this indigenous ethnic group via terror, land usurpation and flawed legalities introduced and supported by UN veto-wielding member states against the consent of both Palestinian Arabs AND regional Arab states (as ones with natural and political claim over the land already), then formation of Israeli would count as nothing less than a legally dressed-up land usurpation and ethnic cleansing of an indigenous population. Moreover, the fact that the Ottoman Empire to whom the land and the people of Palestine previously belonged, was destroyed by the same states (Britain, France and US) who founded the UN and blessed themselves with the veto power, and later supported the formation of the Jewish state in Palestine, is in fact a further testimony about tyrannical alien role in imposition of an alien people and state over a defenseless war-hit indigenous population. So I think based on the above insight, the position of Palestinians and countries like Iran becomes well established. From the historical point of view of the former occupation of that territory by the jews (eg at the time of king salomon untill the destruction of Jerusalem by Titus AD 70 ) there isn't really strong historical basis to claim the territory they are now controlling. Indeed if so, many population could claim back territories that used to be theirs thousands of years ago: Gipsies could claim back some entire territories in India etc... so that wouldn't make a lot of sense. But from the historical point of view of the Shoah, yes they have a right to claim that territory. Jewish people suffered the attempt by the Nazis to eradicate them totally in the most gruesome and terrible way, and so as a global and human answer to that tragedy, they had to be given a piece of land where they could settle and protect themselves. One logical choice was the palestine ( there may have been others choices for other territories this said ...) and so the world 'agreed' to give them these territories that they had no reason to claim back. It has also to be remarked that in the first times, Jews had no intentions to start a 'colonization' of the territory but to live peacefully with the other population, mainly the palestinians. The answer as we know was an attemps by the whole palestinian people to exterminate the survivor of the holocaust, attempt that failed because of the courage and determination of these survivors to defend themselves. The rest of the story is known. So my answer is that Israel has the right to claim the palestinian territory under the historical basis of the shoah. First, there hasn't been a country of Israel in the history of the Arabic, and Persian territories. There was Canaan, which is where the people of Judaic faith, and Abrahamic heritage settled repeatedly in the BC, and established states within the territory named for the twelve tribes of Israel, aka the descendants of Isaac's children. Secondly, there was a country known as Palestine in the BC. Ancient Egypt knew about it, as did Ancient Greece. Ptolemy made a map citing the country. Third, present-day Israelites are not representative of the Jews in Arabia, and Persia. There were Palestinian Jews before the Assyrians, the Ottoman, or the British, and they experienced discrimination from the European Jews in the beginning of Israeli push for more Palestine land because they are Palestine, not European. The basis for the Israeli claim for the land is Canaan, and the British colonial ministry. The WW2 Allies decided to create an Israel so that the Europeans would stop having a Jewish problem. They picked out Israel based on the Bible, and disregarded any other historical description of the countries in that area as Israelis continued to push for more land from the 70s onwards. The Popular Front of the Liberation of Palestine made it clear the conflict with Israel wasn't based on religion, but political. The religion aspect came through courtesy of Israel, the West Allies, and the Arabic rebels who kept insisting the conflict was about Judaism and Christianity against Islam. This also allows for discussion on public platforms to dwell upon the religions of the area, instead of the history leading up to the conflict, in which one empire destroyed another, and thereafter used its colonial power to hand over sections of Palestine land to Europeans that were being persecuted by other Europeans. It does Britain no good to have its colonial past brought up all of the time, which is what would happen if the discussion on the Israeli occupation of Palestine was based on the political aspect. Judaism is a religion, similar to Christianity and Islam, that's why you will find Russian Jews, African Jews, American Jews, Arab Jews etc. Its not a race. Palestinians are a race, their country is Palestine, so you will find Jewish Palestinians as well as Christian and Muslim Palestinians. You make the equation, Palestinians from all religious background were kicked out from their country and were replaced by all sorts of races and nationalities on the bases of religion. So any Jewish no matter what race, occupied Palestine bacame their country and all Palestinians were forced out to surrounding countries. To start with, "Palestinian Arabs" are not mutually exclusive with "Israelite". Historical Israelites didn't all flee through subsequent conquest. Many became Christians: all the disciples without exception. Conversion and conquest didn't cease with the ages. The conversion to Islam and conquest by the Muslims further changed the religious landscape. Some people will claim that Arabness only came with the Muslim conquest and thus all Arabs descend from the Arabian peninsula. If that is your frame, things slightly alter the Muslim conquests, but you're not out of the dilemma that many of the early Jews became original Christians which became early Muslims. The whole region is Palestine and was until 1948, and the whole region was culturally influenced and genetically influenced by the Arab conquest. All of the sovereign entities were mostly (but not entirely) Palestinian Arabs, unless they were foreign invaders. Some of what we call Palestinian Arabs today are Jews, some Christian; but, most of them are Muslim. Arab-ness wasn't as much an identity then as it was post Nassar as it emerged in opposition to Zionism. Jews didn't identify on ethnic lines, because ethnicity wasn't a "thing" until later, and when it was a thing Jewish-ness was already reborn as multi-ethnic under the Zionist frame. To summarize, you have one ethnic group the Mizrahi Jews that descend from Israelites. Prior to Zionism erasing what they were, they spoke Arabic and were culturally Arab. Russian Jews -- like myself -- likely converted hundreds of years later and merely identify as Jews for religious and cultural reasons; the identity grew from struggle. Most Mizrahi Jews are Palestinian Arabs. Palestinian Arabs have their roots with the land. Palestinian Arabs are not just Mizrahi Jews, they're also Christians but currently they're predominantly Sunni Muslim. Mizrahi Jews have mostly forfeited their identity as Palestinian Arabs to acclimate into Israeli's right-wing nationalist landscape. The political situation there has supplanted historical and cultural ethnicity with "religious ethnicity" to forge a nationalist frame for colonization which permits inclusion for Ashkenazi, Sephardi, and other Jews into the new "identity." If that doesn't all blow your mind: I am not a Mizrahi Jew. I have no claim to any land in Palestine. I went to a temple and was a married and chuppa and the state (Israel) and political platform (Zionism) have nothing to do with me, and I reject them. Hope that sheds light on the identity and taxonomy issues! Many Jews were already on the land, as previously established. Jews not on the land, did not originally intend for statehood. I don't think neither the first nor second Aliyah was predominantly Zionist. It is my understanding the first Aliyah were refugees who sought to coexist and the second were socialists. The third gets a bit obvious and undeniable, and the tone changes. Arab reaction to Zionist terrorism (justified and unjustified alike) and WWII really turned the tides forever and served as a catalyst for the current state of affairs. Certainly by 1920 the tides were changing and by 1930 there was an obvious and vibrant political motive. They claimed it was a "land without a people". They also said it was a requirement to have a "home". Some immigrants were religious (but not all), and claimed ownership based on religious texts. Zionists claimed to be socialists to get the USSR to back them militarily. And, then the Zionists switched sides and aligned with the West seeing the opportunity with President Truman. Each time the "justification" changed: from worldwide socialism, to an American satellite to offset Arab USSR-aligned powers. The list of justifications is miles long. Then what happened to the inhabitants of the land? We now know many of them were simply slaughtered and cleansed. The traditional narrative is right in form, but wrong in frame. Many Palestinians fled keys in hand expecting to return. This isn't at all different from the mindset the Jews had when they fled their homes in eastern Europe; it would be a total injustice to say they "just left." The Zionists had well armed and organized right-wing militias, and an air force. The Palestinians didn't. No one wants to die in a losing war, and no one understands the cost of defeat to a right-wing regime. Not the answer you're looking for? Browse other questions tagged israel palestine or ask your own question. What is the current meaning of “Israel”? On what basis do Western countries consider Israel a legitimate country? Why is the Israeli-Palestinian conflict such a big issue? What prevents Israel from expanding into other countries? What is USA's position on the Israeli-Palestinian conflict? What are the viewpoints and policy positions of the Israeli right wing? What alternatives to a two-state solution have members of the Israeli Right proposed?